We are here to help answer any questions you may have. Visit our FAQ page to become familiar with our products and policies. Our goal is to help our customers accomplish their project goals. 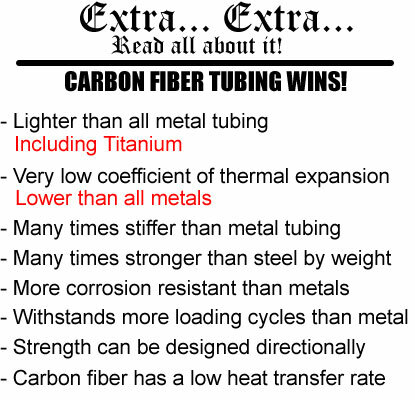 We promise to provide high quality carbon fiber tubing and helpful advice on how to integrate our tubing into your project. Small or large we realize how important your project is to you! April 2017 Boston Marathon - Our friend Mike Hall was kind enough to send us his photo finish as seen in Boston Magazine. Great job Mike! Mike was one of our first flag pole customers. We extend our thanks to Mike and all of the other runners using our product. We can't do it without you. Don't have your super light flag pole yet? Click "add to cart" and we'll ship one to you. Each pole includes 2 / Black LDPE pole caps, custom machined/de-burred holes spaced for your flag (grommet spacing is not standard), de-burr on pole ends, black zip ties, and shipping. *Our 72" pole is more costly due to extra dimensional shipping fees. We only try to cover our average costs with each pole we sell. Our 5 foot pole weighs about 6 ounces without the flag and features directional grip texture making it a joy to carry. 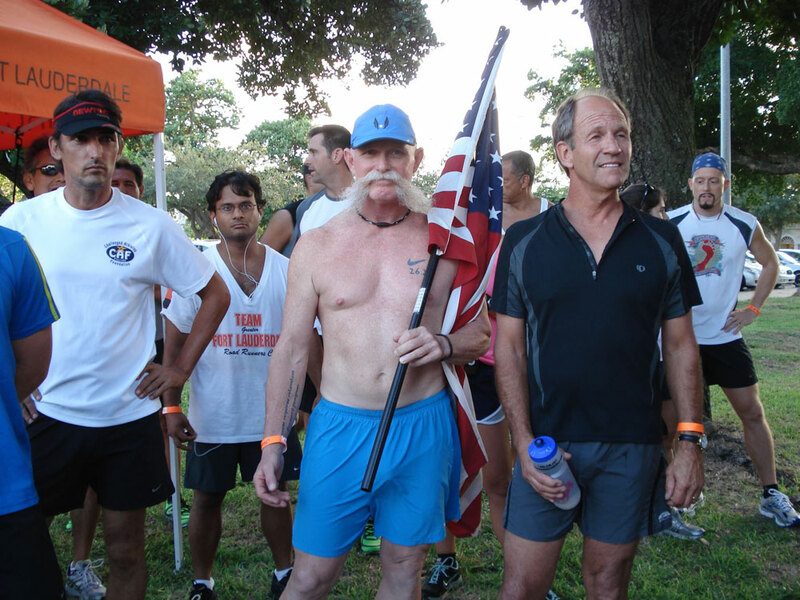 September 2016 - In this year’s event, 62 teams will carry a single American flag more than 4,000 miles across the country, from Washington state to Florida. The relay is a project of Team Red, White and Blue, a nonprofit that aims to enrich the lives of America’s veterans by connecting them to their community through physical and social activity. (Indeed, the theme of this year’s relay is “Connections.”) You can count on us for 2017! March 2015 - Gene Atienza, a 16 year Navy veteran from California (pictured left) runs in the Carlsbad 5000. 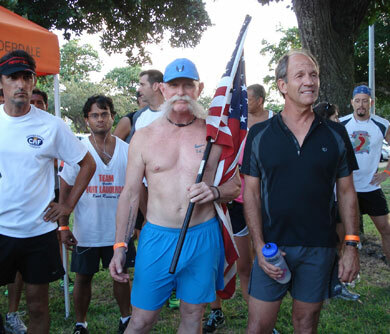 He loves to display Old Glory as he runs to support Team Red, White and Blue (RWB). Gene contacted us to replace the heavy flag pole he purchased from his local hardware store. We said, "Absolutely!" We shipped him a 5 ft. pole with pre-drilled and chamfered holes as well as de-burred ends so it would be comfortable to carry over long distances. His next race is the Disneyland half marathon in September 2015 and we wish him all the best. Team RWB is a national non-profit organization with a goal enriching the lives of America’s veterans by connecting them to their community through physical and social activity. 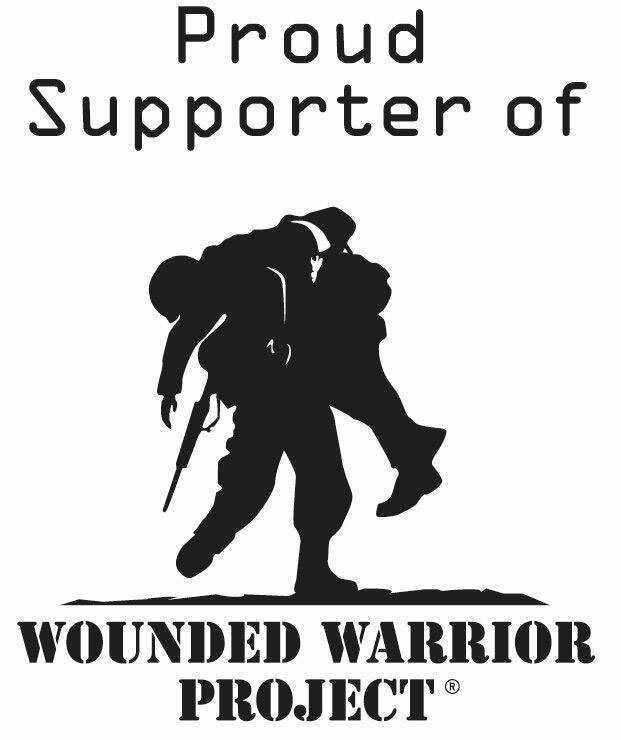 We support Team RWB teamrwb.org If you are a member please contact us for special pricing on your flag pole. 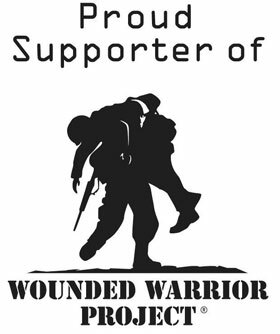 If you're not a member you can still support Veterans by donating or contacting them for service opportunities. We salute you Gene! Matthew, thanks for allowing CFTS to lighten your load. 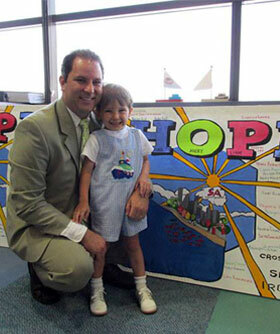 May the ultra-light flag pole we sent you support the H.O.P.E flag and those special kids in as many events as you are able. November 2, 2013 - thousands of athletes competed in the Ironman Florida, but one triathlete stood out among the others. Ironman and father, Matthew Murphy, had a goal to carry as many children born with various birth defects as he possibly can across the finish line at the event as he possibly can. "By rule I can't literally walk hand in hand or carry these children across the finish line without getting disqualified, and sadly some of these children are no longer with us, but I can cross the finish line with their names on the H.O.P.E. Flag (Helping Others, Provide Education) we are creating. I want this gesture to provide encouragement to parents and let them know they are not alone," Matthew states, "and I would love for the community to help me get the word out". Go here for more info. 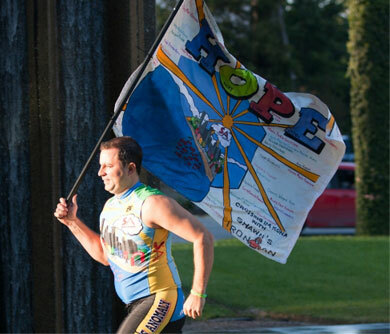 May 20, 2012 - John Pyle completes a cross-country run, called the Patriot Run Across America to raise awareness and money for the Wounded Warrior Project. CFTS was honored to donate one of our carbon fiber tubes to the project so that John would have a light weight flag pole to carry on the 3,144 mile trek from California to Florida. In true humble hero fashion John said "I met thousands of people, who were so grateful for what I was doing. The real heroes are the men and women who are willing to fight to protect this great country”. Thanks for letting us be a part of the project John!